Every morning, the fine folks at Sports Radio Interviews sift through the a.m. drive-time chatter to bring you the best interviews with coaches, players, and personalities across the sports landscape. Today: why Kobe doesn't get hassled in the Hub. Kobe Bryant joined ESPN Radio L.A. to talk about if how the Lakers are playing right now is reason for fans to panic, how he handles the trade talk when he is friends with both Andrew Bynum and Carmelo Anthony, and if tonight's game against the Celtics is just another game. "You know what? It is funny. There is a pretty big Laker following in Boston. So it is not really that bad for me. I guess it all depends on where I go. Just walking around there is a great deal of Lakers fans out here. I think people would be surprised." "That is interesting. The season is an evolution of the team and how long the team comes together. The past couple of years, particularly in big games, we have responded, outside for a couple here and there. This year it has not been there. I think that puts a lot of panic in our follower's hearts, but you have to remember it is an evolution, it is a process. We are not starting the playoffs today. We wish we could turn it around like a flip of a switch but it does not work that way. We have to continue to grind and work through it and I think that is something in my experience and Derek's experience and it shows." "Well yeah, I mean it is about getting better. You want to win those games and it is upsetting to me, trust me, more than anybody else, we can't win those big games or beat those top teams but at the same time we know what we are doing, we know what we are working towards and we have complete confidence in our ability that we will be ready to go." "There is nothing for me to say because it is rumor, so I don't really need to address rumors. I think Andrew is a big boy, this isn't the last time this isn't the first time he will be rumored to be traded, so it is something that you have to deal with. 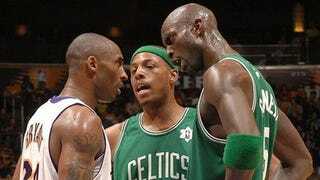 I certainly dealt with it when I was coming up here in Los Angeles with Jason Kidd rumors and things like that. I mean it is something that you deal with as an athlete and you just move forward. As far as Carmelo, I always wanted him to be happy with whatever decision he makes and wherever he ends up." "I let Mitch do his job. He has done a fantastic job to this point and making key acquisitions for us and building this championship team, so I just let him do his job. My role and my responsibility is to manage the team that is assembled and that is all I do. Today we had a good practice. We focused on some executional things that we want to do for the Celtics. That is my role, to keep the train moving, keep it moving in the right direction." "Well it is different in the sense that you have to focus on minimizing the mistakes, even more than normal because you really capitalize on that. I think that is what makes it fun when you play a team like a Boston because they are going to execute extremely well, we are going to execute well, so it kind of becomes a little chess match, so it is kind of a measuring stick for us t see how much we improved since the last time we saw them. It is a huge challenge but I think that is what makes it more than any other game, the level of basketball that is being played." • Ray Lewis has a thing for Salma Hayek. • Johnny Damon has an attendance clause in his contract. • DeMarcus Cousins misses Kentucky.